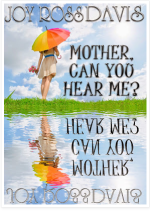 “Mother, Can You Hear Me?” – Inspires Caregivers. 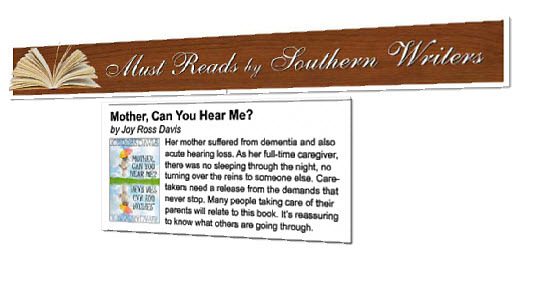 I am so honored to have my personal book, “Mother, Can You Hear Me?” featured in the MUST READS section of Southern Writers Magazine. The honor is increased by the company of other authors who are included in the MUST READS section. “Mother, Can You Hear Me?” is a collection of my experiences as full time caregiver for Mother during her final illness. Writing about our experiences helped me keep balanced during the days as caregiver — as I wrote, I tried to find the humor and human-ness in our situation. Many reviews and readers have told me that the book helped them during their caregiver days because of that very human aspect; helped them keep their own sense of humor during trying times. There comes the time in our lives, if we are fortunate enough to have our parents with us in their elderly days, that the child becomes the parent. But, that situation is only remotely ‘easy’ when working with the administrative part of care. The parent is always the parent — the every day experience hinges on how caregivers permit their parent to be the parent with respect and honor, even while orchestrating daily life for the benefit of the now dependent parent. As you’ve seen in other posts, I am an avid fan of Southern Writers Magazine. As a reader, you will enjoy the other articles available in this and past or future issues. I recommend your subscription to a quality publication. Further, if you are a subscribing author, Southern Writers offers marketing opportunities to benefit your writing.